BREAKING NEWS! Or should we say, ROCK BREAKING NEWS in ARIZONA. Each spring, as it is traditional in Okinawa, Our students learn the art of tameshiwara (breaking rocks) along with a little geology! When Soke Hausel started training in martial arts, most in the US were of the impression this was the primary function of karate and jujutsu -breaking things. In reality, it is a very, very minor part of karate and practiced to assist in development of self-confidence. Many US schools use rebreakable boards, but being that we are a traditional Okinawan martial arts school and Soke Hausel is also a geologist, there are plenty rocks willing to assist us. So, Soke heads out to the field to pick up a bag of rocks. This year, many came from the Salt River flood plain in Phoenix, while others came from the Gleeson Mining District east of Tombstone. The bag contains rocks of all different sizes. 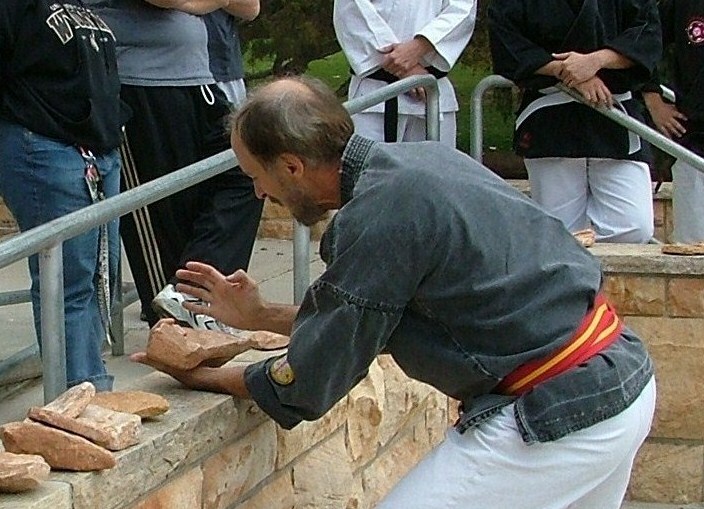 So, for the past 40 years, Soke Hausel has taught this art to a few thousand students and all (exept one) have been able to break rocks after proper instruction.